Arthur Houghton and his wife, Nina, were winter residents of Boca Grande for many years. Before that, he was president of Steuben Glass, chairman of the Metropolitan Museum of Art and chairman of the New York Philharmonic. In all of these roles, he was integral in changes to these institutions. According to Houghton’s son, Arthur A Houghton III, the Houghton family dates to early colonial Massachusetts (1630s). In 1851, Houghton’s great grandfather, Amory Houghton, was a founder of Corning Glass Works, Corning, NY. After graduating from Harvard in 1929, Houghton joined the family business and in 1933 became president of a subsidiary operation, Steuben Glass. Corporate lore recalls that shortly after taking charge of the subsidiary, he became unhappy with the quality of products being produced. As a result, he spent a Sunday destroying every piece of glass in the warehouse. It is said that he and John M Gates, a company vice president, broke 20,000 pieces valued at $1 million. Houghton’s interest in art was combined with the glass business. As he said, he wanted to “produce crystal in the highest standards of design, quality and workmanship, glass which would rank in history among man’s greatest achievements.” Today many Steuben pieces are in museums. “From ashcan to museum in half a generation” became the company’s slogan. Houghton remained associated with Steuben for 40 years. During this time, he took several leaves of absence during which he pursued other interests. In the 1940s, he served as curator of rare books at the Library of Congress and then was an officer in the Army Air Corps from 1942 to 1945. His interest in collecting rare books led him to endow the Houghton Library at Harvard for the university’s collections of rare books and manuscripts. From 1952 to 1974, Houghton served on the board of the Metropolitan Museum of Art in New York. He was president from 1964 to 1969, when he worked to modernize the museum’s administration and curatorial system. He was also responsible for the centennial celebration of the museum and its decision to acquire a significant primitive art collection. 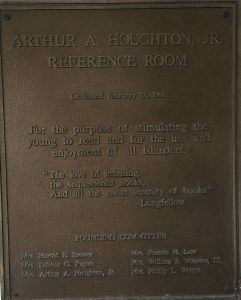 From 1969 to 1972, Houghton was chairman of the museum. In 1952, Houghton also became a board member of the New York Philharmonic Symphony Society. 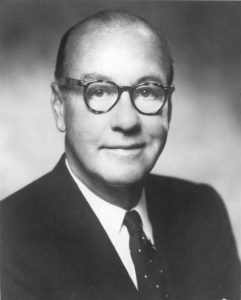 He continued on the board until 1965, including being chairman from 1958 to 1963. During this time, he was also vice chairman of a committee to create the Lincoln Center. In 1962, the Philharmonic moved from Carnegie Hall to the Lincoln Center. Houghton was also a vice president of the Pierpont Morgan Library, president of the English-Speaking Union, trustee and chairman of the Cooper Union, honorary trustee and chairman of Parson School of Design, vice chairman of the Fund for the Advancement of Education and chairman of the Institute of International Education. At Corning, he worked with his cousin Amory Houghton to create the Corning Glass Center, which opened in 1951. The Center became the Corning Museum of Glass. He also donated the land for the Corning Community College. Houghton bred Black Angus cattle at his estate, the Wye Plantation, on Maryland’s Eastern Shore. The Plantation was later donated to the Aspen Institute. Houghton died here in Florida in 1990. His wife, Nina, continued to live part-time in Boca Grande and was integral in the activities of the Friends of the Community Center, the Boca Grande Child Care Center, the Royal Palm Players and the board of the Community House. She also helped develop the museum at Whidden’s Marina. 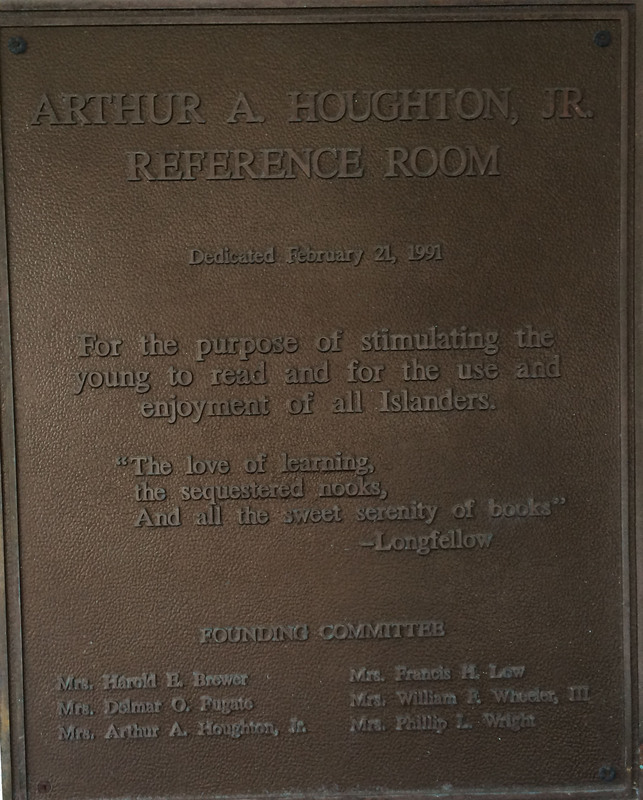 The naming of what was the Reference Room at the Boca Grande Community Center and is now an important meeting and presentation room is a local recognition of Houghton’s dedication to education.